NSW public service whistleblower David C. Paull explains how the State's mystifying mining approval sausage machine works. 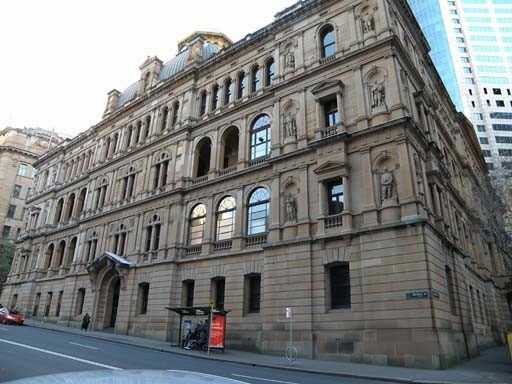 23-33 Bridge Street (pictured right) looks like just another departmental building in the central business district of Sydney. Once inside and past the security guard, it is even less impressive, with dilapidated corridors of peeling paint, crammed public servants working in "open style" offices and grimy windows letting in inadequately dim, yellowish light. But don’t let this dismal exterior fool you. Inside these walls, miracles can happen — and often do, particularly if you are a mining mogul. These are the walls of the NSW Planning Department. While political shenanigans and backroom deals are expected in the hallowed halls of Macquarie Street, it is in Bridge Street where the secret meetings, the legislation rewrites and the policy changes are constructed, given life and set free. Free to drop their life-destroying goodness over the people and land of New South Wales. Ever since the freedom of information revelations made public in the Sydney Morning Herald in December last year, which showed how the Rio Tinto chief Harry Kenyon-Slaney had “several discussions” with the Department of Planning following a meeting with Barry O’Farrell 11 days earlier to discuss the revival of the Warkworth Expansion Project after its repeal in the Land and Environment Court (LEC), it is obvious that it is "business as usual" in Bridge Street, as the recent approval of this same mining project has shown. But how does this magic happen? As one who has first-hand experience with these events, I shall explain. I was until relatively recently, employed within the Office of Environment and Heritage (OEH) to process mining development applications and make recommendations on the Conditions of Approval for these projects and have walked these corridors. But let me start at the beginning, as it all works at several cunningly inter-connected levels. Apparently, not all government departments are equal and the current Coalition government in NSW has given the idea of the "super-department" its fullest evolutionary potential. The general pattern of departmental hierarchy goes along the following lines. If you are undertaking reviews and assessments using experts in their fields to provide the best possible advice, you are a minor department. If you are an approval authority or a department that deals more directly with big developers, you are a super-department. A case in point is the Planning Department and its relationship with the Environment Department in NSW. Firstly, water was hived off and put into a separate unit under the Department of Primary Industries (DPI), following the route of the Catchment Management Authorities (CMAs) some years before, which are now virtually powerless. Then, make your junior departments "offices", just to show them who is boss. What was once known as the "Department of Environment" is now merely the "Office of Environment" — even though the office has many times more employees than the super department. Moreover, the minister of the environment is now a junior minister under the minister for planning. What does this imply? In practical terms, the senior minister is in charge and propositions put by the junior minister are not considered to be "whole of government" if the senior minister is not in agreement. An example is the new "NSW Biodiversity Offset Policy for Major Projects", constructed in part by technical experts on the issues, but major policy directions are worked out in collusion with Planning and Resources bureaucrats which ensures that no "perverse outcomes" arise. To make matters even more confusing, the current planning department minister – the honourable Robert Stokes – has changed the title of his department to the "Department of Planning and Environment" just to show they really do care about the environment. However, do not be deceived — as this is the only real change he has made since he has taken over from the evergreen Pru Goward in 2014. The public service was once a career to be cherished and providing a life time of service to the community and the public good. While there are many "permanent" employees left, most middle and senior management positions in the public service are now only available under short term contracts — usually two years. This way, performances can be closely monitored and checked to see if they clearly adhered to "corporate goals". Corporate goals, you say? Yes, all public service departments in NSW now have corporate goals, which is more often couched around "client satisfaction" than the "public good". This is even so in the OEH, where now only a fool would dare mention the good of the environment. So what is the result of this corporatisation? A compliant management staff in the public service which would do anything to roll-over their well-off salaries and benefits for another two years. These people tend to be rather intolerant of junior staff with silly ideas about environmental well-being. And if you do really well, then your position in the hierarchy becomes assured, and there aren’t many of those. One example here would be my old boss in the Hunter office of OEH, Andrew McIntyre. Hand-picked, largely, because of his prior collaboration with mining companies. However, I would like to focus on the real wizards of Bridge Street — the architects of mining approvals, who have been around for a considerable time: Howard Reed (coal seam gas and underground), Mike Young (open cuts) and David Kitto (chief wizard). David has had a rough trot lately, with various public disclosures, and has been moved sideways and, though replaced by Mr Young, is still there, lurking in the shadows of Bridge Street. Let me show you their modus operandi. With customer satisfaction now the overriding primary concern of the public service, there are few bigger customers than Rio Tinto, Glencore, BHP and other mining companies. They have special needs, are bigger than most (except perhaps for some real estate providers) and with a mining crisis looming (not mention that ridiculous, feel-good notion of global warming), their special needs right now are to get as much coal out of the ground and money in the Swiss bank account as quickly as possible. The Warkworth experience was a nightmare for Rio Tinto. Where else in the world where they operate could a pubic environmental interest come before profit? Unthinkable. No wonder poor Harry was on the plane and knocking on doors in Sydney before you could say “vested interest”. So, despite the community winning two cases in the Land and Environment Court against this mine development on a merit appeal – largely based on health and environmental matters – the magicians were at work. Their solution? The Planning and Assessment Commission (PAC), which removed community rights of appeal on merit in the LEC, and the Mining State Environmental Planning Policy, which prioritised economic outcomes over environmental and social, such that only one box had to be ticked. This latter move was righty perceived by the community as being highly unjust as the stench was smelt across the land. So much so that the new Minister Stokes boldly announced that he would restore the "triple bottom line" late last year, just in time for the latest round of planning decisions regarding the Warkworth expansion. But this turned out to be a very cynical exercise, as the issues relating to the environment were dealt with using the new offset policy which, as I mentioned before, has had transparent environmental outcomes squeezed out of it. Not an approach that is favoured, as it can be risky, but when all else fails, the Planning Department uses the old tried and tested tool of ignoring or manipulating the advice of the junior departments. It is here that the magic of the Bridge Street bureaucrats comes to the fore. After all, what would a scientist understand about state priorities? This can come in two forms, either add in words with nebulous meanings so that conditions cannot be regulated, or just change the wording received by the junior departments in their approvals so that entirely different standards are made conditional. An example of this occurred during the Warkworth approval process. After after receiving my recommended conditions, I was amazed to find that the conditions published by the Planning Department for the approval had changed someone’s front yard to an area of "derived grassland". This had no factual basis. When I contacted the Planning Department to notify them of this error, I received a message from Mike Young (via my manager) that I was just out to ''… get them into ICAC'' and that the email ''never existed''. One day, maybe – just maybe – let's hope the Wizards of Bridge Street will have cast their final spell. The NSW EPA: Whose interests do they protect?